A home gym is not complete without a safe and heavy duty adjustable weight bench. It is an essential piece of equipment, not just for doing bench press but for many other weight training exercises to train all the muscle groups of your body. An weight lifting bench helps you to perform the moves correctly and safely. Also, it can be used with other equipment like power racks, dumbbells, etc. In case you are searching for the best workout bench for home, just keep checking out this page. We have collected the best models here, compared and reviewed them honestly. I hope you will find the most suitable model that will support your training for long years. 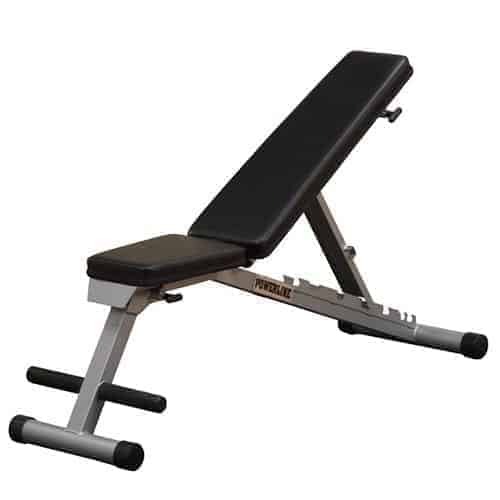 L. 66" x W. 66" x H. 65"
The Ironmaster Super Bench﻿ is an excellent option and will take care of all your weight-lifting needs. The high weight capacity makes it ideal for individuals who lift heavy weights in various positions and require a heavy-duty and solid commercial incline weight bench. This is a versatile adjustable weight lifting bench that comes with many angles to choose from (starting from 0 °all the way to 85°). It uses a foot lever to change the positions without bending. You may choose to use it for decline bench press in case you purchase an attachment for it. Its seat has three different heights you can use, and it is removable. You only need to slide the seat slightly to rest in any position. Note that the seat follows the backrest, so it will always be perpendicular to the back to prevent you from sliding as you use the incline. It has a 10-year limited warranty. This covers replacement or repair for mechanical integrity for only home users. Wear and finish items like painted surfaces and rubber are not covered by the warranty. People who already own this home gym workout bench agree that the unit is an absolute dream. Each piece is built to last a lifetime. It comes assembled. However, you’ll need to bolt on the feet, but everything you will need to do this is already provided. People also noted that even though it allows you to add attachments, it is not a must to have them. No wobbling and no tipping while using it. This Ironmaster bench is indeed supper. With the 11 different angles, it helps you to target every muscle in the upper body. It will be sturdy at 60lbs and will hold whatever weight you lift. Its design is unique so as to allow you to add any attachment to it easily. In my opinion this model is the best weight lifting bench set you can have at home. The Bowflex SlectTech 5.1 is an incline workout bench that makes working out much easier while offering a full range of exercises. The main feature is that it has six different positions, i.e. -17° decline, flat, 30°, 45°, 60° and the full 90° that allow ultimate workout versatility and doing different exercises. ​The bench can adjust to two different positions when working out. Hence you will not slip as you exercise. ​It also offers a stable base when working out with a dumbbell and you don't need to worry about losing grip on the seat. ​The seat is adjustable, so it enables one to get in the best possible position and ensure maximum support and comfort as they work out. 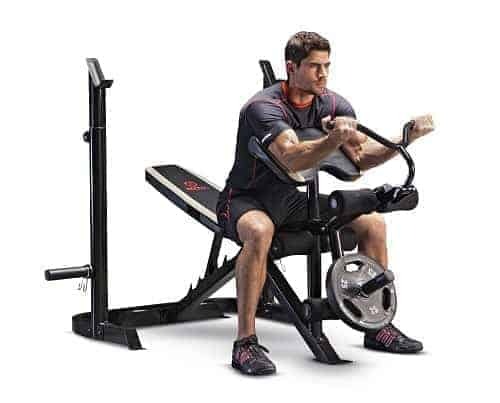 The construction is the next best feature as this Bowflex bench is constructed out of commercial quality steel which makes it a heavy duty bench which can handle heavy weight people. ​It has durable upholstery which is easy to wipe and clean after you exercise and a good base that offers great balance and stability. ​It also has a removable leg attachment which easily pops out like a pin for added support while on the decline position. The manufacturer offers a 30-year warranty on the frame and a one-year warranty on the upholstery. ​Very easy to assemble the parts, and most people say that it took them at least 30 minutes. 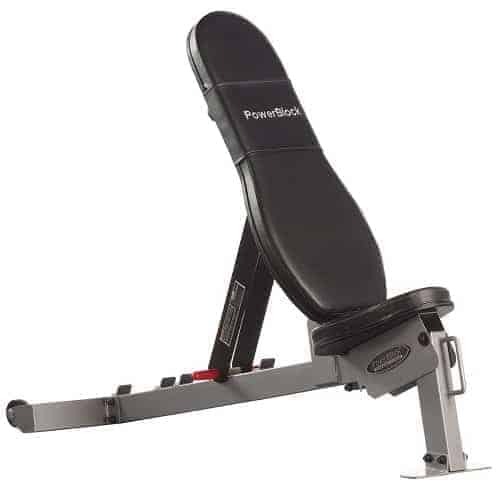 Find more reviews and details on Bowflex 5.1 bench here. Customers say that 5.1 is a quality bench that maximizes effectiveness and minimizes the risk of injury. A better version than the Bowflex 3.1 and 4.1 worth the money that you buy it. This adjustable bench allows you to take dumbbell workouts to the next level due to its sturdy and versatile nature. You can comfortably perform bicep curls, dumbbell chest presses, shoulder presses and leg lifts, giving you a maximum workout. The bench has separate seat and back pads which have tapered upholstered cushions and will help you sit comfortably as you perform your workout. Maximum comfort during your workout is key as it helps in reducing the chances of injury and ensures you enjoy your work out even more. ​Has built-in wheels for easy mobility, making it easy to move from one point to another. ​Has an optional dip attachment that is purchased separately. ​It has a very wide backrest which can support a wide range of body types. ​The seat pad can be adjusted downwards when in an inclined position to prevent you from slipping forward as you lift. ​The dimensions are 50L x 16H x 21W (in inches). Read more Power Block SportBench reviews. It is a great piece of home gyms exercise equipment as no assembly is required. You only need to attach the rear bottom support bar which should take less than five minutes! I recommend it to anyone looking for a strong and sturdy bench that requires minimal assembly. 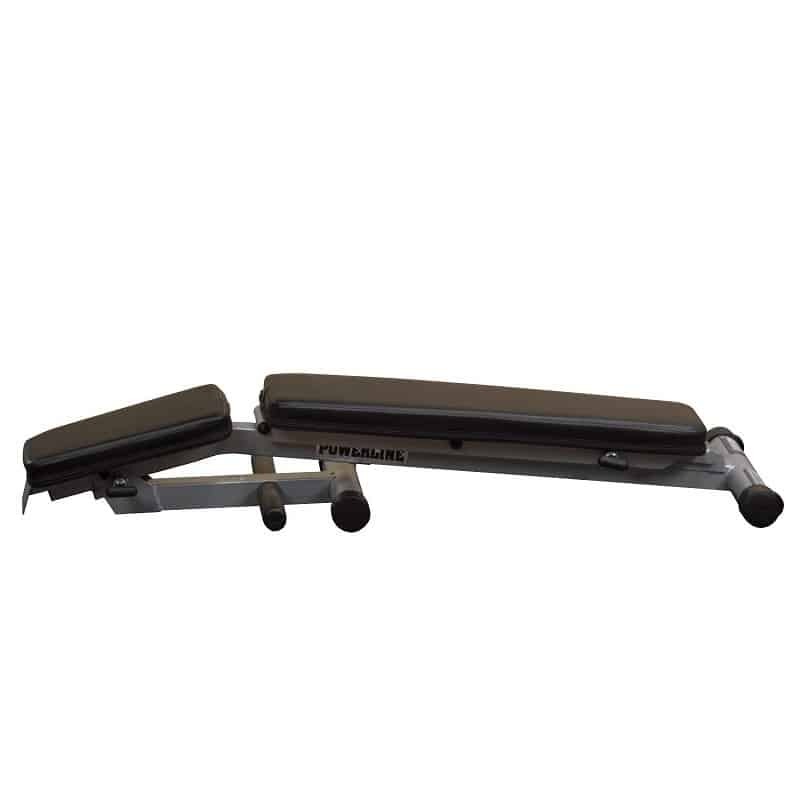 This compact folding weight bench has seven adjustable positions meant to help a user do various workouts. Flat bench, incline and decline press, and shoulder press can be done with different adjustments. The additional angles also provide more options for targeting different muscle groups in the upper body. It can also be positioned at various angles, making it easier to perform workouts such as triceps and curls extensions. The unit also comes pre-assembled. What you need to do is to unfold it and then roll it to the place where you perform your workouts. You'll be instructed on how to store it when not exercising. The unit can fold upwards too. This is one feature that isn’t offered by other fitness benches in the market today. ​The padding is not very comfortable, and the adjustable positions are sometimes not stable at some levels. The reviews this unit has received are mostly positive. Most of them praised the bench since it provides great free weight exercises. Its wheels and folding for storage feature drew lots of thumbs up too. Others also appreciated the fact that it comes pre-assembled, making it easy for you to use immediately. It's difficult to criticize this unit for its shortcomings especially because of the price it goes for. This model is actually a great bench option. If you happen to be a beginner athlete and you are trying to decide if you will get into weight training, consider this equipment. If you are already experienced in training, consider getting another Powerline bench that will offer you more options. Either way, you can still purchase it if it’s still a better option for you. The backrest can be adjusted six times. The positions you can use include decline, so you will have everything you require for chest presses, incline presses, decline and military presses. You can also adjust it to a flat position for your fly. Other than the backrest, the seat can be adjusted into three positions making it easy for you to support yourself. 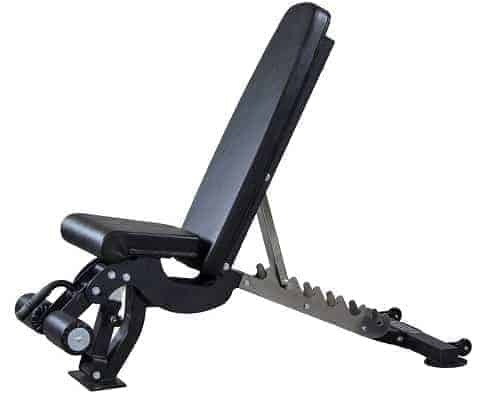 Many adjustable workout benches in the market today leave a gap between the backrest and the seat. But, the ability to adjust the Marcy SB-670 seat is a plus for this unit. 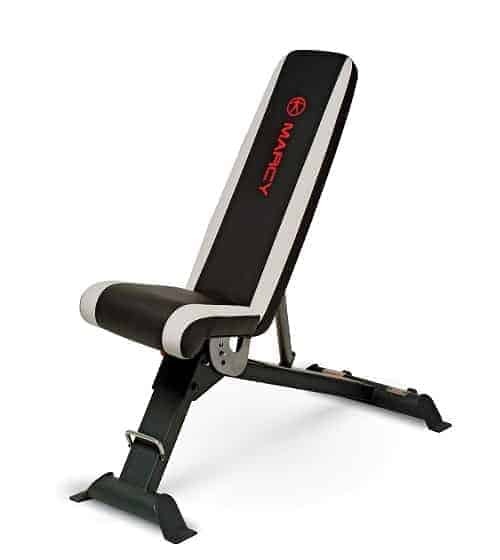 If you would like to begin weight training or you are just looking for a home gym bench that can help you do numerous workouts to stay healthy, we recommend that you check the Marcy SB-670 out. ​The padding is not only thick but also comfortable, making it easy for you to enjoy your workouts. ​Affordable and will offer excellent value for money. ​It has a transport handle that helps a lot when moving the unit around. ​This fitness bench has a 2-year warranty. This is a long period for you to test its functionality and confirm its sturdiness. This adjustable exercise bench is functional and very comfortable thanks to the thick padding on the seat and backrest. Moving it is also easy because of the handle grip and transport wheels. It can also fold making it ideal for you no matter how small your training space is. This bench press set is ideal for use with cage, power rack or dumbbells smith machine while working out at different angles. 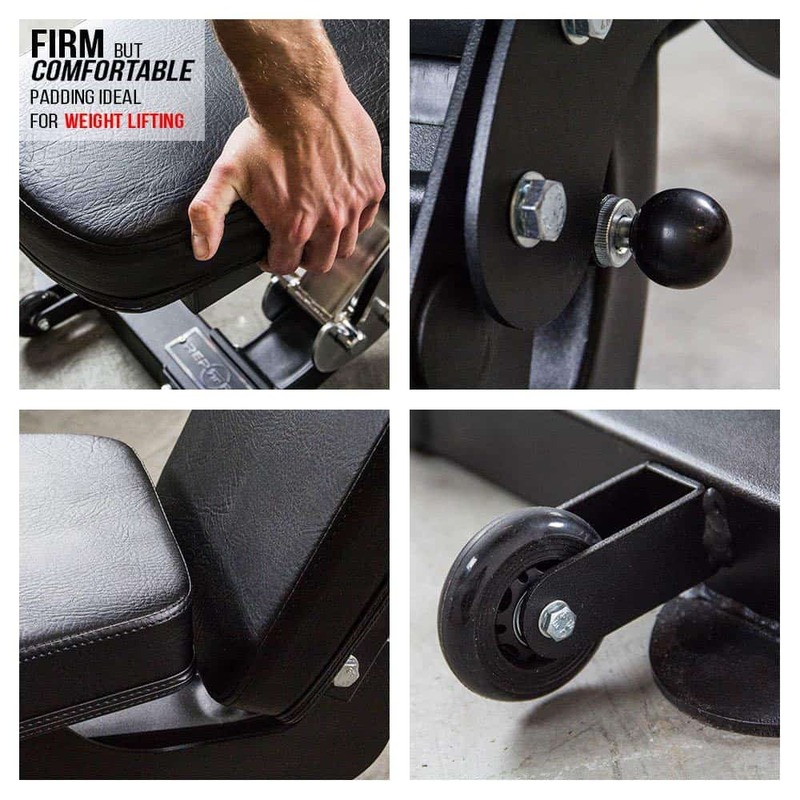 Its best feature is that it can be adjusted to 7 positions from -20 degrees to 85 degrees and the seat is adjusted to 4 different angles to give more support as the back angle changes. The seven positions are adjusted on a bare steel back adjustment ladder which prevents the flaking and chipping of paint from metal on metal contact. It has roller pads that you can use to lock your legs as you exercise on the decline. The rollers are covered with vinyl which makes it easier to clean. Made of 11-gauge, 2” X2” box steel which makes it strong enough to hold a great deal weight i.e. up to 1,000lbs. It’s ideal for use at home as it is light in weight and it is easy to move it around because it has wheels on the rear. Comes with a thick, firm 2.5” bench pad that is wrapped in durable textured vinyl, so as to offer maximum support and comfort. The pad also measures 11.5 inches in width at the shoulders, and there is a minimal pad gap in between the back and seat. The height from the floor to the top of the pad is 17.5 inches. It measures 54x26x17.5", so whether you are short or tall, you will have your feet on the ground as you exercise. For people who have bought this gym equipment, they say that they are happy worth the investment they made. Although this equipment is not cheap, it’s worth buying it. 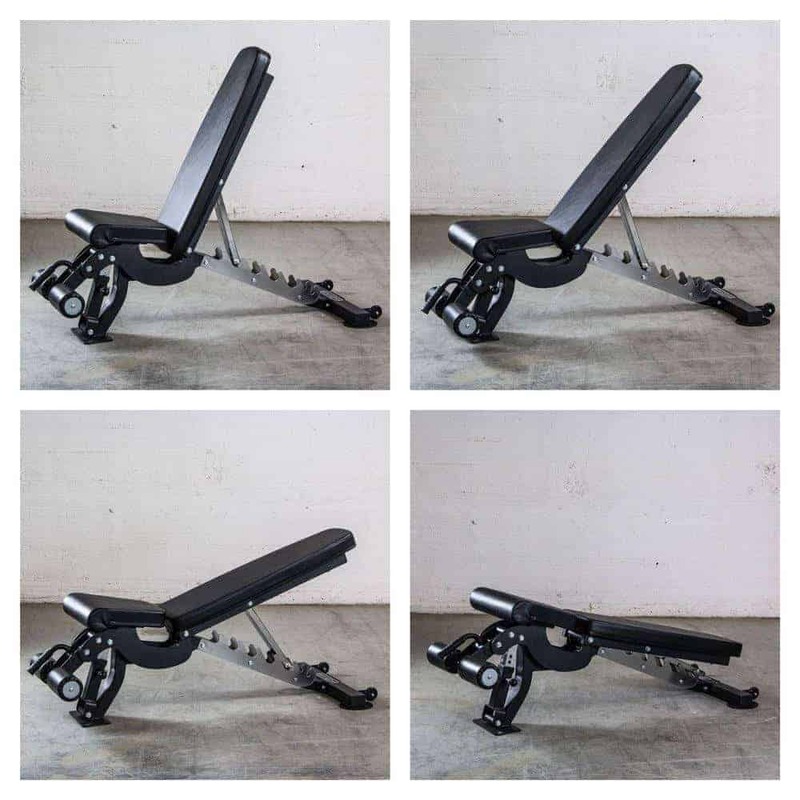 This is a foldable bench that allows one to perform a broad range of exercises mainly targeting the upper body. The best feature is that it has the much needed position, i.e. flat, inclined and declined (FID) which are better as you exercise. The decline position is the best work out the bottom part of your chest, and it helps one focus on pectorals, shoulders, triceps and muscle endurance. 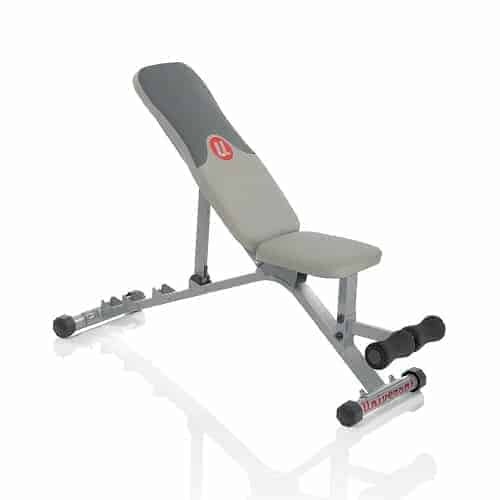 GFID225 is functional, portable, durable and compact workout bench. If you don’t have sufficient space in your home, this is the best adjustable weight bench for the money as it has a height of 9 inches when flat which makes it easier to slide underneath an average bed or stand upright at a corner. ​7 total adjustment positions which deliver all the versatility one needs as they exercise. At the front, there are pegs which offer the body stability when working out and there are 2” x3” oval tubing ensure support and durability for the heavy workouts. ​For easy and quick mobility and protection of the floor, this equipment has wheels. The bench measures 57 x 16 x 18 (L x W x H) inches and it weighs 54 pounds which support a maximum weight of 1,000 lbs. ​Customers review is that GFID225 is entirely worth the money though it doesn’t have the 90 degrees position which makes one not be able to do some shoulder exercises. The material is very solid and is of high quality which makes it easy to clean. ​You also don’t need to assemble it because once you remove it from the box; GFID225 is ready to be used. It has a lifetime warranty if only is used at home but not for commercial purposes. The warranty covers all the parts of the bench. Buy this bench if you need a strong equipment without extra bulky attachments to store. This bench is sturdy and reliable which offers you a variety of features and positions, adding variety to your workout, especially your weight lifting program. It allows you to perform upper and lower body workouts and incorporate dumbbells to hit your goals of muscle building and maintenance. It is also an excellent model for core exercises such as twists and crunches. It has anchor posts at the base of the frame, which allows you to attach resistance bands for variety in your workout. This is great for you if you are looking for a gentle toning option, for more senior users or for those undergoing rehabilitation. ​Has 7 backrest adjustable angles and 3 seat adjustments for maximum back support during lower body, upper body and core exercises. The seat and back cushions are covered in leatherette material with box stitches for extra comfort and support. ​Comes with transport wheels and handles for ease of movement. 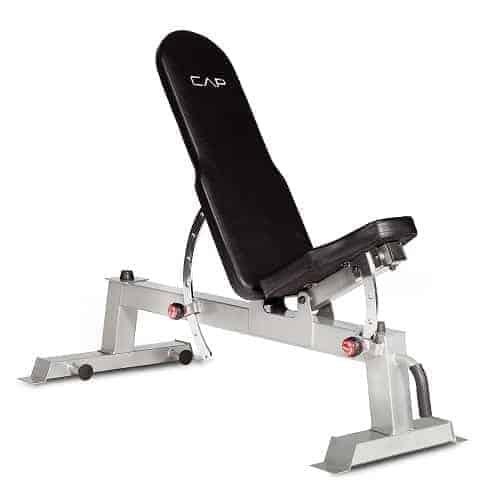 If you are looking for a reasonably priced weightlifting bench that will not take up so much of your space, the CAP Barbell Deluxe Utility Bench is the equipment for you. Not only does it promise you a great workout, it is also very sturdy and comes with clear assembly instructions. This bench allows you to increase your overall body strength and lean muscle mass and at the same time helping you increase your metabolic rate to burn calories. It allows you to have a full body workout as it has an upright bar that you can use for squats and lunges, while the bench also doubles up as a utility bench for abdominal, leg and bicep workouts. This unique bench, therefore, gives you a total body workout in the comfort of your home. 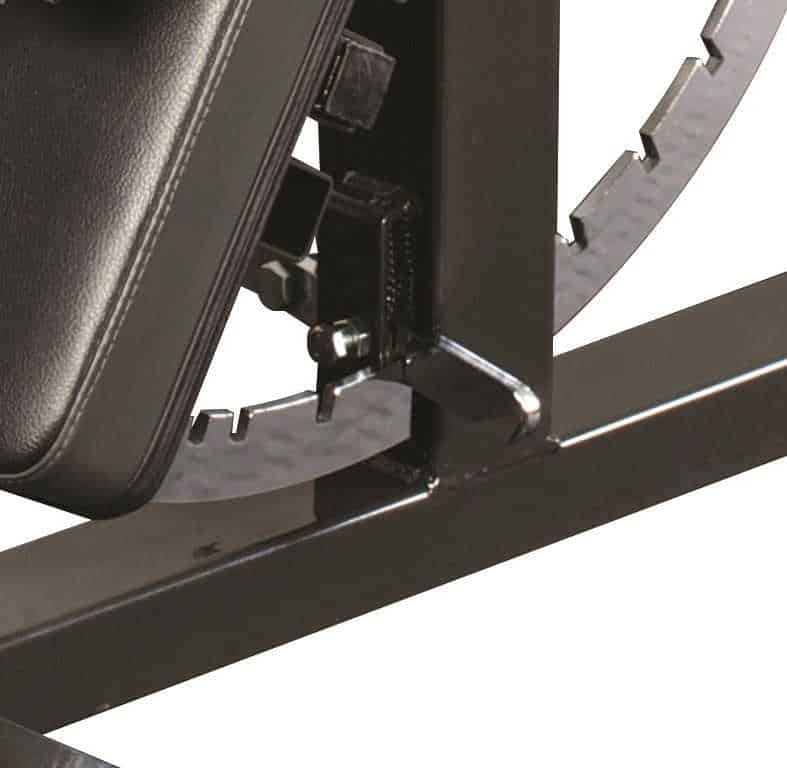 The Marcy Diamond Adjustable Olympic Weight Bench MD-879 is easy to adjust and very easily secures in place even as you perform strenuous exercises. This is a very important feature as it helps you exercise with maximum peace of mind. You can find more Marcy weight bench reviews here. This Marcy gym set is made of tubular steel frame that is powder coated for durability. Has a multifunction utility bench with 5 different positions. Has padded vinyl pads and seats and backrest for comfortable workouts. Has a separate 2-piece squat rack for walk-in squats and lunges. ​Has a fully adjustable back pad for decline, incline, and flat chest press workouts. ​Has contoured foam roller pads that support your form, giving you a total leg workout. ​Adjustable barbell crutches which allow you to easily change the bar height to conform to your needs. ​Has a built in post for convenience in organizing and storing weight plates. 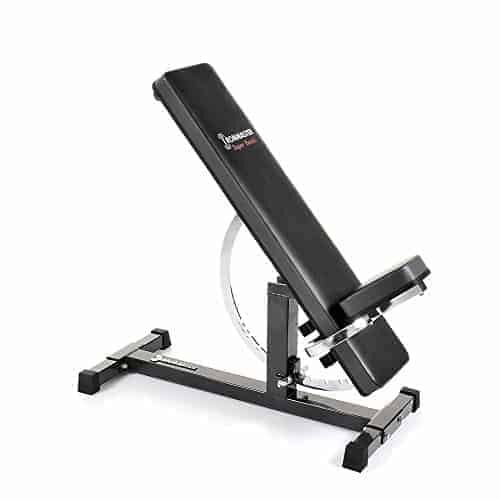 ​Has an adjustable preacher curl pad with a detachable bicep curl bar for extended bicep workouts. ​Supports up to 600 pounds. 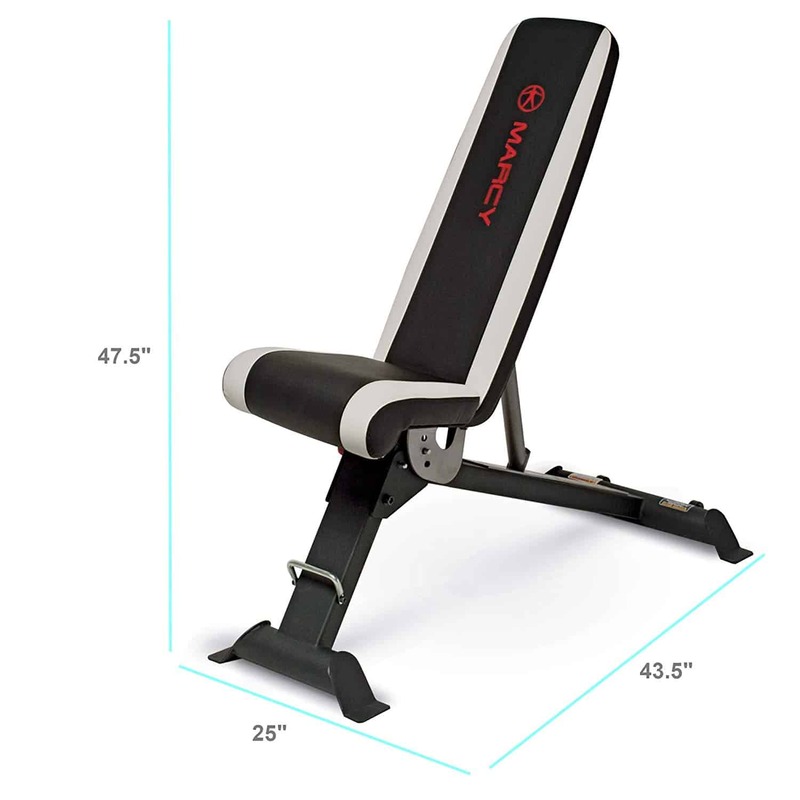 I highly recommend this Marcy home gym for anyone looking forward to performing strenuous bench workouts on a very sturdy equipment. The price of it is also very reasonable. The best weight bench set for home came to help people support their back comfortably and safely instead of lying on the floor. It is great workout equipment for those who weight train because it gives them the ability to maintain posture, technique and breathe all at the same time which can be difficult. For the new learners, they can learn new training exercises without falling over and use the momentum of their body. This is very important, and you need to invest much in buying an excellent build equipment. It should be made from steel and heavy gauge tubing which is usually a strong metal that doesn’t rust or wobble easily. Check the product specifications that are given by the manufacturer so that you know if the user weight and weight load capacities fall within your range. There are 2 reclining weight bench types i.e. utility and benches with racks. The utility doesn't have racks, but adjustable. This type is the best bench for dumbbell workout. They are less expensive because they don’t require much hardware and are not the best for heavy lifters. The benches with racks are best for heavy workouts for those who use barbells which give more stability to compound movements, and the racks provide safety catch. The style you choose depends on the workout you will be doing. It should be quickly adjusted to multiple positions without having to screw a pin in or out. For more effective workouts, then the best models enables one to exercise with a flat, incline and decline angle and with these angles you can do a wide variety of training exercises and target various muscles. A good weight bench set has upholstery that is at least an inch thick so as to offer more comfort as you exercise. A thin padding on the side and back pads will make it uncomfortable as you exercise and can cause back pain. Check that the upholstery is sewed with box stitch as this is the best stitch against wear and tear. A small workout bench, but of good quality is good for a home gym rather than getting an expensive huge bench that is meant for health gym or commercial gyms. When you want to buy a multi weight bench, it is important to get one which is suited for you so that you don’t just put it in the house and you don’t get to use it. You must first understand clearly what kind of strength training program that you are going to be involved in, know what your goals are and what your routine is. This determines the type of equipment that is best for you and your weight lifting program. ​The kind of training will determine the kind of bench to get. If you are a serious weight lifter, then get a product that has an adjustable rack so that the barbell can be held at arm’s length. ​The position of your workouts matters when buying your exercise bench for home. Most models provide the flat, incline and decline (FID) positions, but the angles in which they can be adjusted differ. For example, it's best to have a bench that has an adjustable incline if you want to focus on your upper pectorals and shoulders. A metal rod is used to lock into place underneath the cushion of the bench at different heights. ​The cost is very important too, because there are cheap weight benches and expensive ones. It is advisable to get equipment that you can afford, but also get a bench that will serve you well and enable you to do all your workouts. If buying online, consider the shipping costs, although most sites offer free shipping. 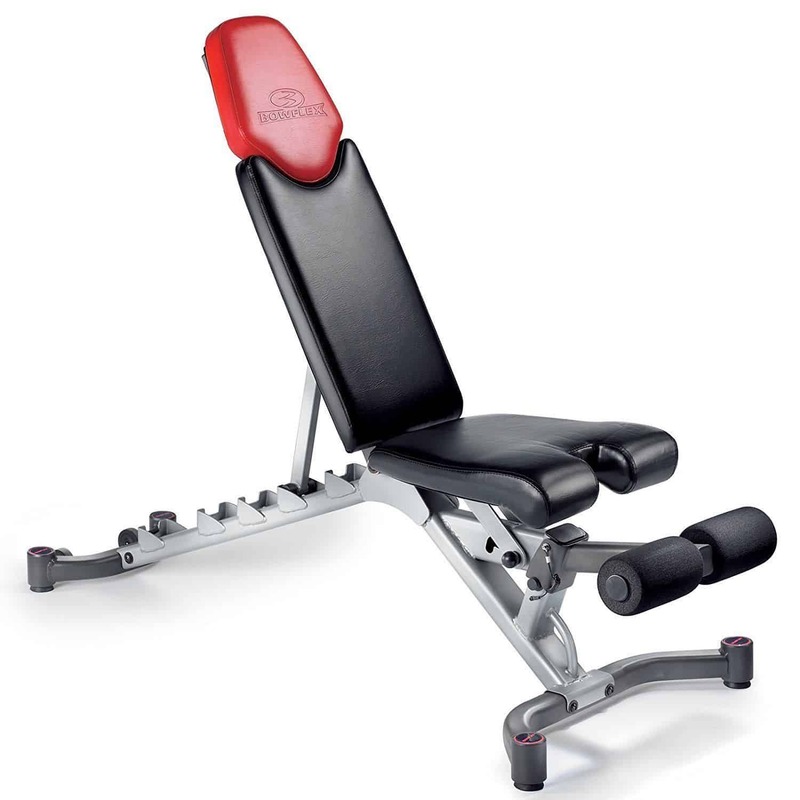 Check online for the reviews of the type of adjustable gym bench you want to buy. You will get much information on the pros and cons of different models, and this will give you an insight on which bench to buy. ​The space in your home determines the type of bench to get. If you have limited space, then get a foldable bench, which you will fold once you are done with working out so that you can use the space for something else. Different home workout benches have different weight capacities so according to your weight you will be able to know which is the best bench for home gym that can handle your weight. 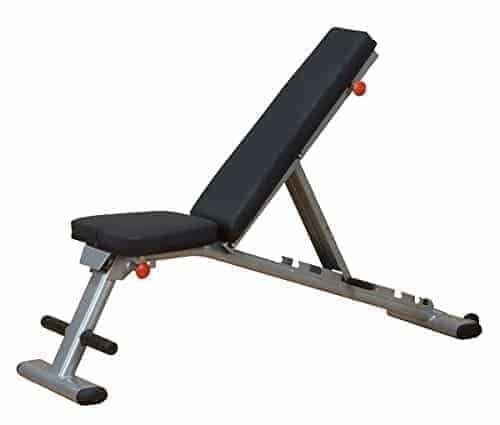 However, a strong, durable and stable exercise bench will be able to handle any weight and also the burden of lifting. An all in one weight bench is a good workout equipment that you can add in your home gym. Make sure that you consider the above features and which is best incline bench for you. Remember, purchase a bench that you will enjoy working out on. Can I use these benches outdoor? No, since they are not protected against the weather. So, they get rusty and the upholstery may go bad. ​What is the best ​buy workout bench? In case you are searching for durable equipment that lets you lift really heavy weights I recommend Ironmaster, you will not regret it. In case, you are on a budget and you need one for just fitness purposes, then Marcy will do. 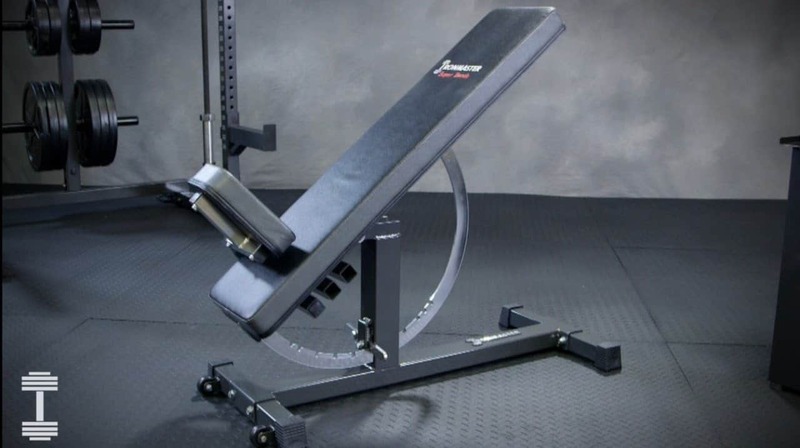 ​Did you find the best weight bench for you? Share this guide with your friends.